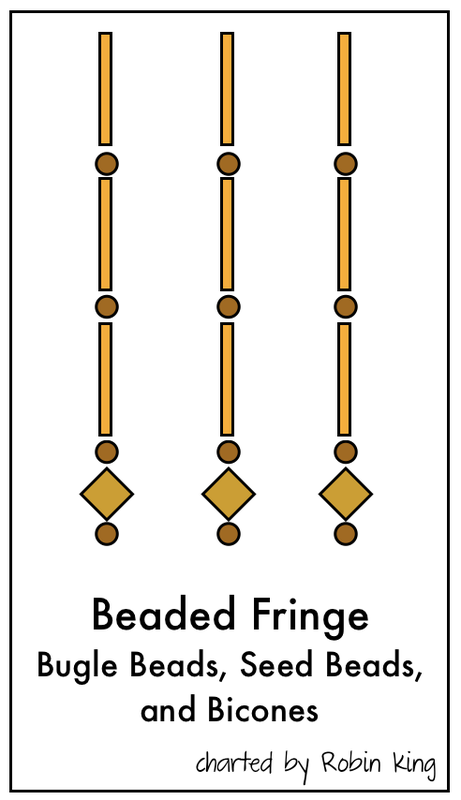 Thought I'd wrap up our conversation on Beading. 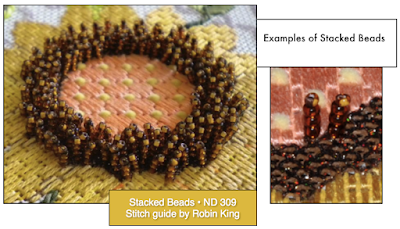 So far we've talked about Stitch Beading and Bricked Beading. Today we will talk about some other Beading techniques you might want to use on your needlepoint. 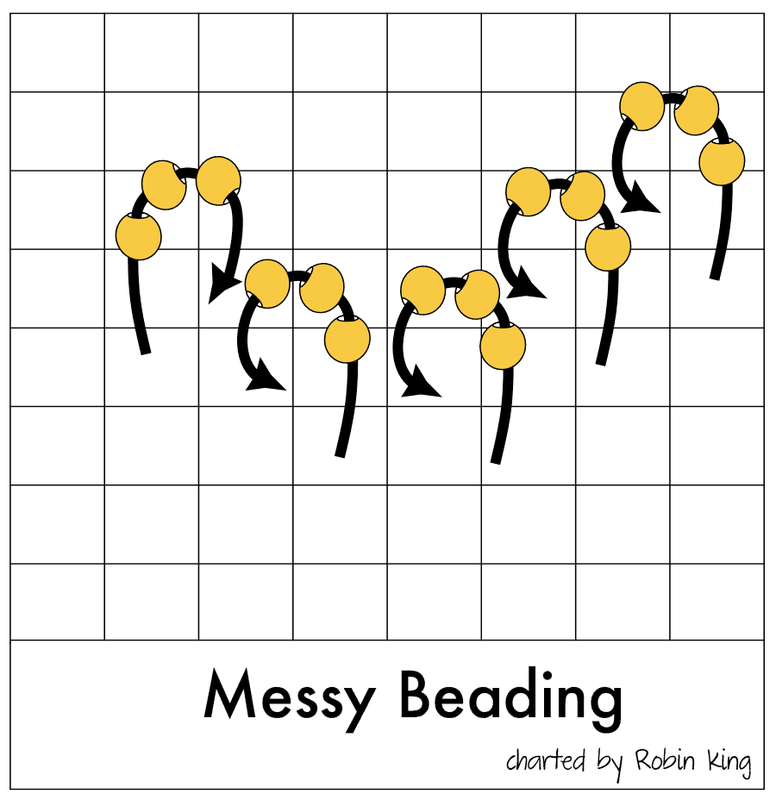 Let's begin with Messy Beading. I first heard about this from another needlepoint teacher, Julia Snyder. 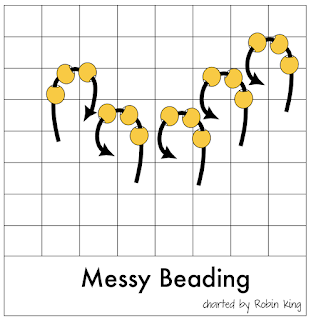 I'd like to show you how I do Messy Beading. 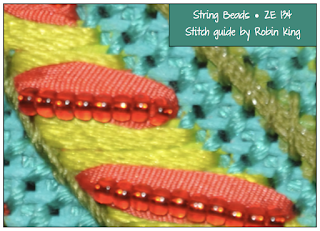 The general concept is to add multiple beads at a time per stitch. Permission given to add the Beads in a random fashion; pile them on, if you wish. When I was stitching this flower on the "Flowers in a Vase" canvas (ND 311), I wanted a "ring" of beads at the outer edge of the flower center. I was going for a 3D effect and decided to try Messy Beading. I used size 11 Seed Beads and added 3 Beads at a time per stitch. I really liked the look. Thank you, Julia for your endless creativity. 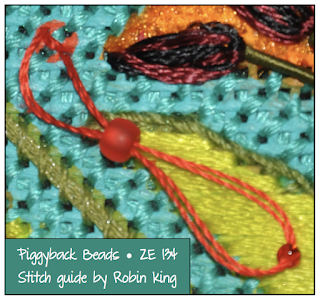 Next let's talk about Piggyback Beading. It is when you have one Bead stacked on top of another Bead. The larger Bead is on the bottom and the smaller Bead is on top... going along for the ride. When I was stitching the "Lotus Squared" canvas by Zecca (ZE 134), I used the Piggyback Beading technique for the Red Dots. I used size 6 Bead for the bottom Bead and size 11 Bead for the top Bead. What a great way to take deal with dots; letting the Beads do all the heavy lifting. 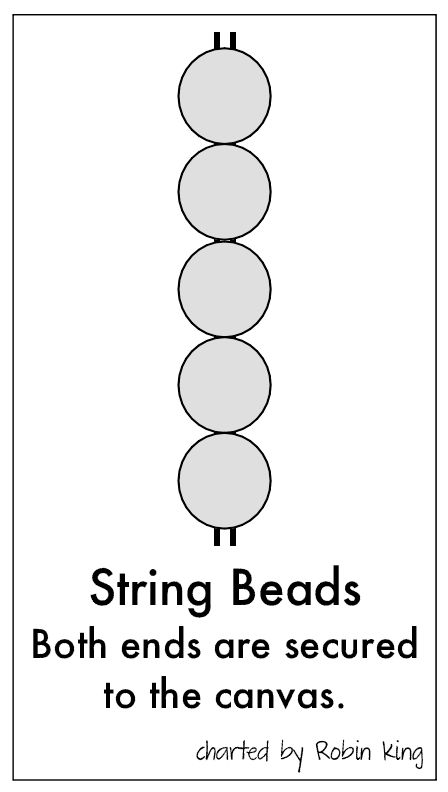 Next let's talk about String Beading. 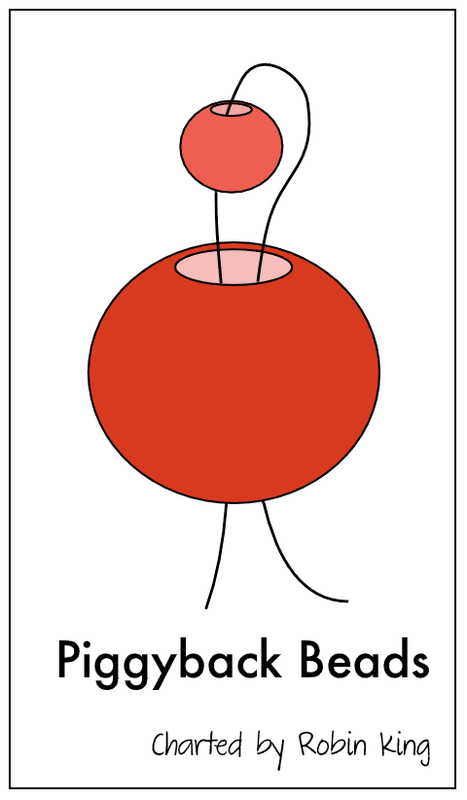 This technique can have both ends attached to the canvas or one end attached with the other end loose. I used the "both ends" secured when I laid down a string of Beads on top of a Ribbon for some extra decoration. 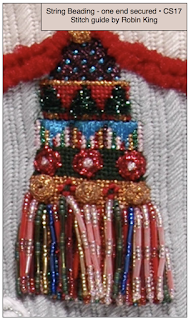 I used the "one end" secured when I made a Tassel with Beads on my "Nutcrackers Christmas Stocking" (Shelly Tribbey CS17). 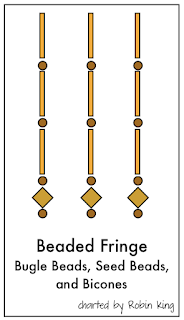 Notice how you can use a combination of Beads (Bugle Beads and Seed Beads). 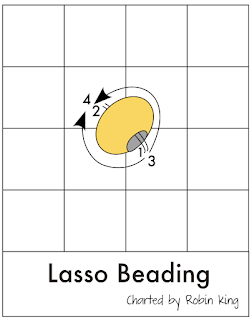 Next up: Lasso Beading. 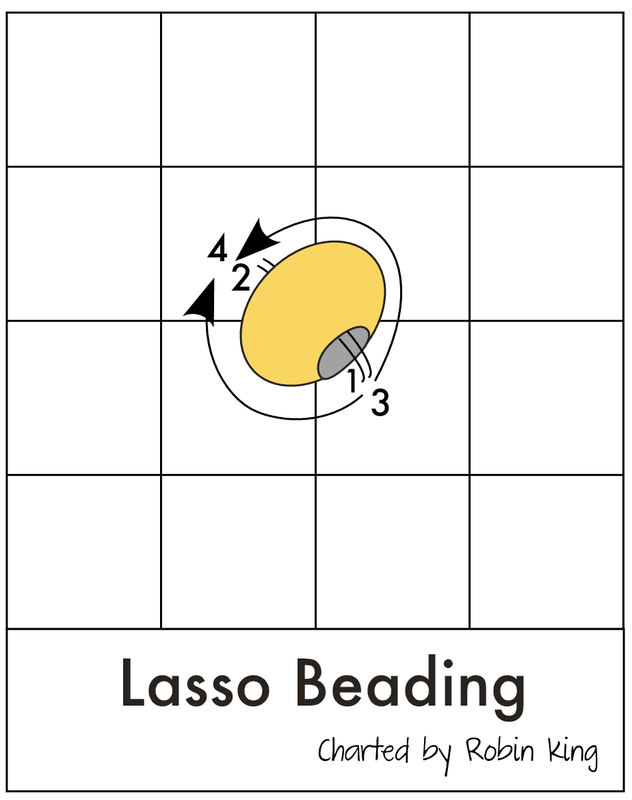 I use the Lasso Beading Technique when there is a single Bead standing all by itself. Last technique I'd like to mention is the Stacked Beads. This is what I did on the "Sunflower and Berries" (ND 309). You bring the needle up where you want the stack. Add the Beads that make up the stack. 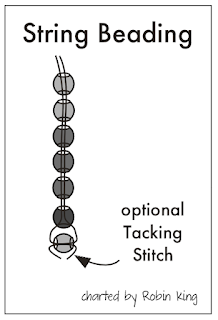 Take the needle and thread back down through all Beads (except the top Bead) and give a little tug to make the stack stand up. 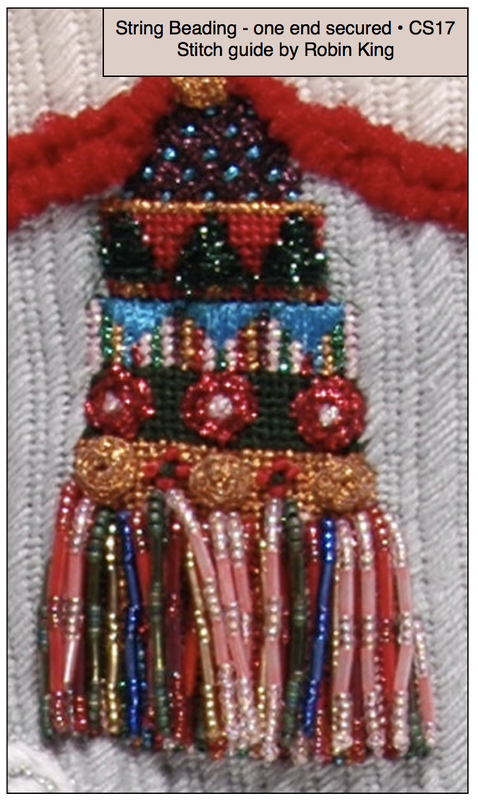 My last helpful hint is to secure (on the backside of the canvas) the beaded technique before you move to another area. 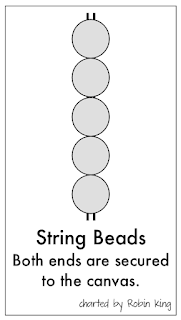 We want to make sure the Beads don't get loose! Well, that's all for now. Time to see what's for lunch. On Facebook, Cindy Heiar said, "Messy beading can also be done with different colors of beads, different sizes and different shapes. It's fun to play!" Thanks for the great suggestion, Cindy! Great review of beading techniques Robin! Thanks. 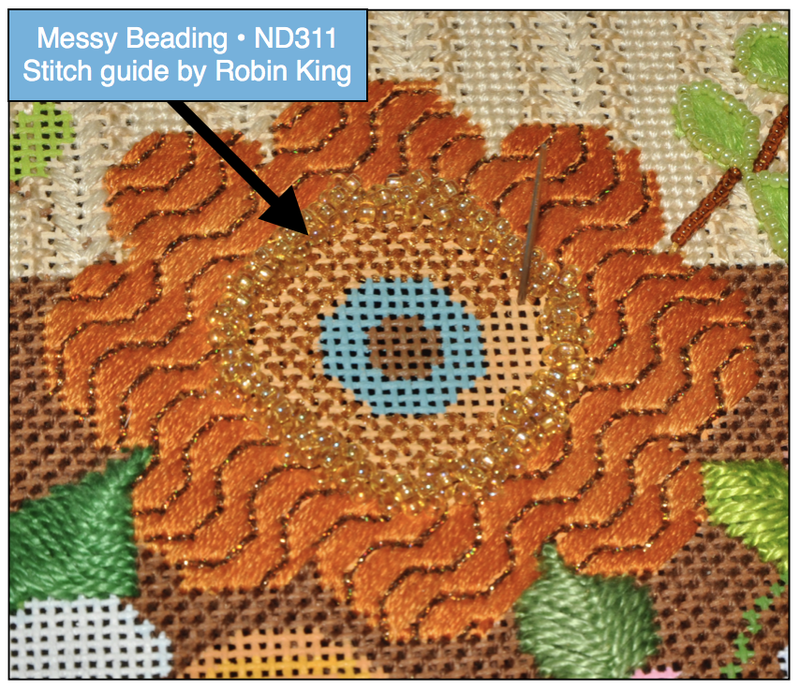 Needlepoint Study Hall is the collaborated efforts of Robin King and Peggy McGowan. Needlepoint is our passion. We love to share and inspire you through this blog. How Did that Design Get on Canvas? A Tutorial: Stitching With "Paint"! Say you want to post a comment or ask a question on this blog. Say you what the post to sign your name rather than being Anonymous. Create a Google account! It is free. You do not have to answer all of the questions in the User Profile page. But under display name put your name or your nick name. 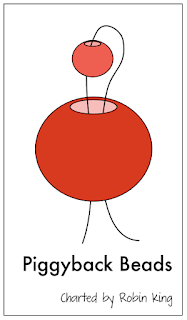 For example, you may want all of your comments on this or any other Google blogger site to be signed "Long Tall Sally". That is the name you put into your display name. You will have to sign in to your Google Account each time you want to post with your name or nick name. You will be prompted to sign-in, so have your user name and password handy.